Jesse’s TV commentary on education and race has been featured on numerous local and nationally broadcast programs including, HBO’s “Problem Areas” with Wyatt Cenac, CNN Newsroom with Carol Costello, PBS News Hour with Gwen Ifill, Keith Olberman’s Countdown on Current TV, The Dan Rather Report, Democracy Now! with Amy Goodman, and The Real News Network. Jesse Hagopian joined an many experts in education to discuss the struggle for education on season 2 of Wyatt Cenac’s “Problem Areas” show for HBO. Professor Wayne Au and Jesse spoke to Amy Goodman on Democracy Now! about the MAP test boycott and the standardized testing craze. Jesse appeared on Keith Olberman’s Countdown program after he was arrested at the Washington State Capitol building protesting the budget cuts to education. Jesse attempted to make a citizen’s arrest of the state legislature because they were breaking Washington State law with regard to education spending. Then the students at Garfield organized a walkout in protest of the budget cuts. After months of protest, teachers, students and parents in Seattle, Washington, have won their campaign to reject standardized tests in reading and math. In January, teachers at Garfield High School began a boycott of the test, saying it was wasteful and being used unfairly to assess their performance. The boycott spread to other schools, with hundreds of teachers, students and parents participating. Last week, the school district backed down, announcing that the Measures of Academic Progress — or MAP test — is now optional for high schools, but those refusing the test must find another way to gauge student performance. 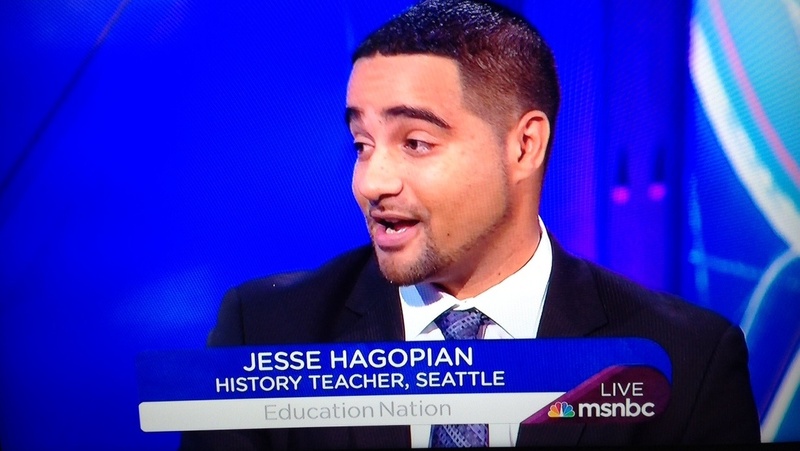 We speak with Jesse Hagopian, a high school history teacher and union representative at Garfield High School. KING 5’s Mark Wright talks with Garfield High School teacher Jesse Hagopian and testing coordinator Kris McBride about opposition among teachers at the school to certain mandatory skills tests. “I think the district has failed to take racial justice seriously,” said Hagopian.